Ok, heres the dig on the brand spankin' new Rescue 77 home page. Luckily I was informed, by an inside source, that there was a brand new show called Rescue 77 starting on the WB network. 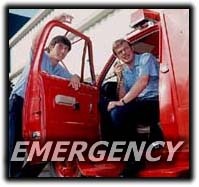 Now personally I have never watched a single show on the WB network, but I thought, "heck, its got firefighters, medics, and is sorta like an updated version of the great 80's show Emergency! so I might as well try it". I figure that since it is the very first show ever, if I dont like it, there's no reason to keep watching. All I can say is wow. This is one of the best shows of all time! From the very beginning, you feel like you know the characters, the plot, and the commradrie among the paramedics, and the rivarly against the firefighters. This show is better than L.A. 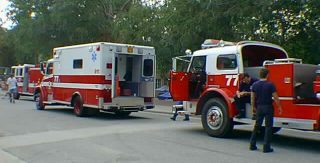 Firefighters, a short lived Fox show, and E.R. put together, and I love E.R. Rescue 77 is really a great show and i suggest you see the next episode. The first episode, the one I'm talking about, aired last night, 3/15/99. There is a special episode tonight, 3/16/99, and from then on the show aires every Monday and Tuesday nights from 9pm to 10pm (check your local listings). This page will soon be a whole heck of a lot better, however since this page is put up on the day after the first show, I'm sure this is/was the first Rescue 77 page on the 'net. But I will soon have screen shots, Wav files, character Bio's, etc. So check back often!